After four stellar years at Yale University, where she racked up 84 points (41g-43a) in 117 games, Bray Ketchum joined the CWHL and was a part of the Boston Blades 2015 Clarkson Cup championship team. 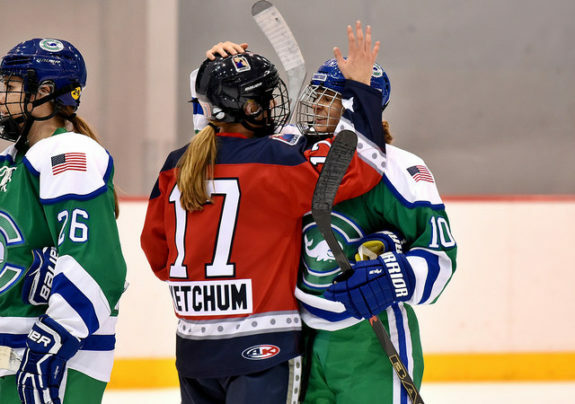 Following the title, and the inception of the NWHL, Ketchum signed with the New York Riveters and tallied 14 points (10g-4a) in 18 games – which was more like the player fans saw play at Yale, rather than with the Blades (10 points in 41 games). Ketchum is a pioneer and a trailblazer, on and off the ice – as a player, she is creating awareness and opportunities for future generations of women to have a platform to continue their hockey careers after college. Off the ice she has been a teacher, is a part of a charitable foundation that not only honors her late friend but also helps others in her name. 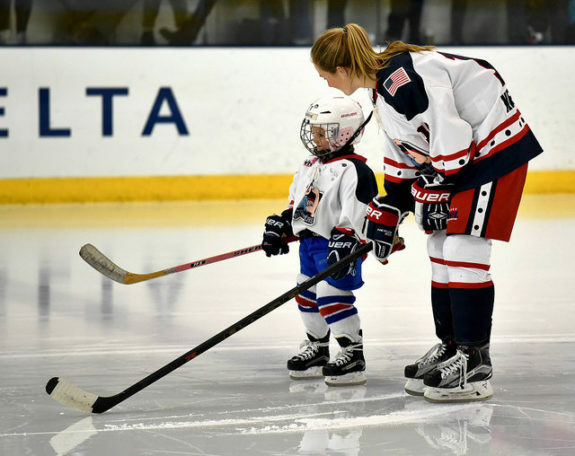 Basically, she’s awesome, on and off the ice, and the NWHL is fortunate to have players like Ketchum and the other women in the league who are such great role models for everyone. 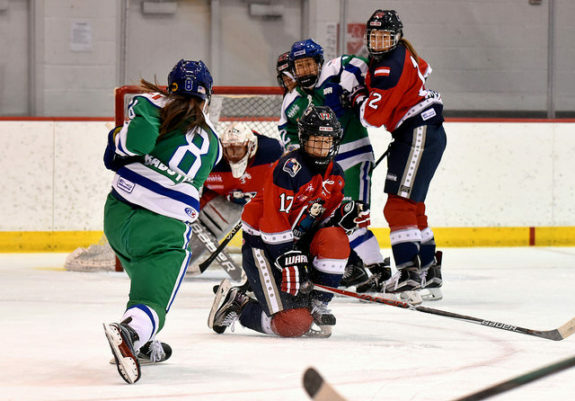 This season the Riveters are off to a great start (2-3-1) six games into the second NWHL season and are likely to surpass last season’s win total: 4. 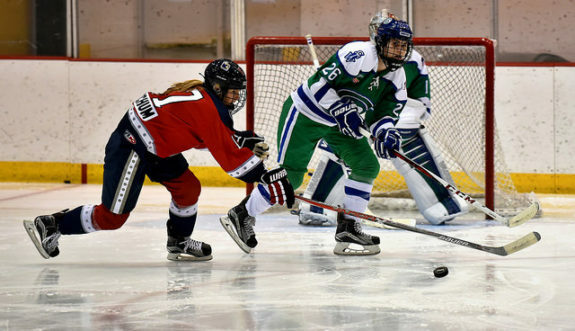 Following a Tuesday night practice, The Hockey Writers spoke with Ketchum about a myriad of topics from college to the pros and her connection with a current St. Louis Blues player. The Hockey Writers: You played hockey collegiately at Yale University, which also isn’t the easiest school to get into. Tell us about your experiences there. Bray Ketchum: Yale was great; I had four years of awesome teammates and that was one of the reasons I chose Yale was the team and the coaches. The academics were hard and balancing everything was difficult, but I kind of learned how to manage things in high school playing three sports and then playing club hockey outside. I was kind of used to the time management of it, but I loved it. It’s kind of weird I’ve been out of college for five years already (laughs), but it was a great experience. THW: What was did you major in there and have you applied it to your day job that you have today? BK: American Studies. I worked at Chelsea Piers (Connecticut) for a few years out of college and was doing some sports management stuff. I transitioned to teaching and always had a love of working with kids. The last two years I taught in Boston and then in Brooklyn last year. This year I just joined my brother in a startup (business) and we’re launching a sports nutrition company. We just launched our plant-based, protein smoothie. So I’ve kind of had three different types of roles out of college and I’m really just trying to figure out what it is that I really want to do. I’m really excited about this new opportunity with my brother, so I guess the American Studies played in when I was teaching, but otherwise not really. THW: We know why you wear no. 17, but for those that don’t can you explain the reason why and how it ties into your time at Yale? BK: One of my teammates at Yale was Mandi Schwartz, she was also a linemate of mine at the time, was diagnosed with Leukemia my sophomore year. She left school and battled for two and a half years and passed away my senior spring. She taught me a lot about the love for the game, the love for your friends — to lose a good friend like that really puts things in perspective. When I had the opportunity to be able to choose my jersey number I decided to wear 17 (Mandi’s college number) for her. Her parents were really excited when they heard that and it’s another reminder of her every time I put on my jersey. If she was still alive today, she’d definitely be playing in this league and probably playing for Hockey Canada; she loved the sport more than any of us at Yale. It’s very special to wear this number on my jersey. THW: So it’s a safe assumption that her brother, Jaden Schwartz, knows that you wear that number for her? BK: Yeah and he also just recently changed his jersey number to 17. I’m on the board of the Mandi Schwartz Foundation (info here) and we still keep in touch with the family pretty closely. The Schwartz’s have been great. THW: Did you know growing up that you always wanted to play hockey? BK: I learned it at an early age, playing street hockey with my brothers; they always put me in the goal (smiles). Once I got the chance to skate I loved it. I played boys hockey all through Bantams and then played in high school, where I actually played three sports — field hockey, hockey, and lacrosse. It was kind of a toss-up for a while between hockey and lacrosse, I knew I loved hockey but I kind of wanted to go to a school where I could do both. Eventually, I just stuck with hockey, went to camps for that, talked to coaches — I actually played lacrosse my senior year in college, which was fun. But yeah, I always knew since I was little that I wanted to be a hockey player. THW: Last season you had a phenomenal individual season (10 goals/14 points/5 PPG), but the team struggled at times. As a group, you all got to go to Japan, which not everyone has the opportunity to do. What were some of the highlights that you take away from that first season of the NWHL? BK: I think overall the season was extremely special; until the end of the season I was still in awe that it was happening. To be able to experience Japan as a team, to be able to play in that first NWHL game together as a team…were some of the moments I’ll never forget; and playing in the Winter Classic. There were some big highlights last year and I think as a team, more than anything, we grew — as a team, as individuals — and that’s what I’ll take from that year. We got better as the season went on, even though the scoreboard didn’t prove it. Overall we were just thrilled to be there and have that experience together. THW: You mentioned the Winter Classic, had you ever been inside Foxboro Stadium? BK: I hadn’t, no. I’ve been to one New York Giants game, so being in that stadium was just incredible. I get chills thinking about when we walked out there and saw what could have been, (laughs) a packed stadium. It was an amazing opportunity and I am so fortunate to be able to have played in that. THW: In that game, Denna Laing gets injured and that had to be like going from the ultimate high to the ultimate low, right? BK: That was a tough moment for everyone. It was kind of tough to keep playing after that…we were all there enjoying the moment and then we all just continued to think about Denna; she was on our minds the whole game. She’s been an incredible fighter through this whole thing. THW: You re-signed early this summer with the Riveters; you’re from Connecticut, was there a chance that you would have signed with them? You know a lot of the players on Boston from when you were with the Boston Blades (CWHL), was there a chance you could have signed with them? BK: I was really excited after season one and I have a lot of respect for Chad (Wiseman, Riveters GM/head coach) and what he’s doing for this organization. I didn’t think twice about whether I was going to go to Connecticut or Boston. I wanted to be a Riveter again and if I got that opportunity I was going to sign with them, and I’m happy to be here (smiles). THW: The Riveters now play in Newark, New Jersey after playing last season in Brooklyn. Is that a longer commute for you, did it factor into your decision and did you know back then that they’d be skating here? BK: We heard rumors of where we were going to be. I was actually living in Brooklyn last year and I would drive (to the rink). This year I’m living in Manhattan and I can take the PATH train (to New Jersey). It’s really not that bad, I don’t have to deal with traffic taking the train (smiles) so I don’t mind it. THW: This season your team added someone you’re familiar with, did you help to recruit Kaleigh Fratkin to the Riveters? BK: Fratty? No, she came on her own, but I was really excited. I played with her on the Blades and we’ve stayed close friends since then. She’s a great defender and we’re excited she’s signed here. THW: Around the same time Amanda Kessel signed with the Rivs, that had to be pretty exciting, right? BK: It was really exciting, I think we have a great team this year, all around. We’ve added some great forwards, some great defense, and three goalies; I think we’re set. THW: We don’t want you to compare last year’s team with this year’s team because they are completely different, but, the team seems younger and faster this season; would that be accurate? BK: There are a lot of new faces and it’s great. I think overall our forwards have a ton of speed, our D are big and strong, really physical, and our goalies are proving themselves. All around I think we are jelling as a team at the right moment right now. THW: The million dollar question that we ask a lot of players is: how do you beat the Boston Pride? They haven’t lost in almost a calendar year and if you want to win the Isobel Cup championship, someone is going to have to beat them two times in a three-game series (if the NWHL playoff format is the same). BK: We proved ourselves last time we played Boston, we played really well in the first period. I think when we play our system when we play the way Chad wants us to play, we do a great job. We’re physical, we’re all over them on our forecheck, we get a lot of shots and I think, every team can lose any day. Yeah, they’re a tough team. A bunch of Olympians that play together all year-round, have been playing together for a few years. I think we just have to stick to our gameplay and not get frustrated, and good things will happen.